A dividend king is a company that has increased dividends for at least 50 years in a row. I first compiled this list in 2010, when it only consisted of ten companies. My last article from the past week showed how the list has expanded in the past six years. I find this list helpful as a way of studying the reasons behind those successful companies - after all only a select few have managed to raise dividends for over half a century, which is a very rare outcome. Robinhood is an investing app, which burst into the investing scenes in 2014. This broker is only available on smartphones, but allows for commission free investing. When the investor pays nothing in commissions, they get more money to keep for themselves. Unfortunately, this broker is still relatively new and untested, which is why I only have a token amount invested there. I am excited to potentially move a larger portion of my business there. Back in August, I provided a model dividend portfolio consisting of 30 individual stocks for early retirees. This model portfolio of course was not a recommendation to buy, but more of a list of companies that I would consider purchasing if I had a lump sum that I wanted to invest for income today. Using a service like Motif Investing, someone can initiate a position in as many as 30 individual companies all at once for a low commission of $9.95/trade. In this article I discussed how I went from zero net worth and dividend income to $15,000 in forward dividend income in a matter of eight years. The secret sauce is that I have a high savings rate, which was helped by my frugality. Of course, this article was written before Richard Kinder decided to cut dividends by 75% - the number is a little over $14,000 today, but could exceed $15,000 by the end of 2016. I screened the list of dividend champions, and isolated companies which have managed to grow dividends by at least 5%/year over the past 1, 3, 5 and 10 years. I believe that companies which have managed to grow dividends every year for over a quarter of century, deserve a second look for further analysis. I also believe that those companies that manage to grow those dividends at close to twice the rate of annual inflation deserve a second look. The reason is of course to find those companies which have the potential to keep delivering more dividend increases. Motif Investing allows you to instantly create your own custom dividend portfolio consisting of up to 30 individual companies. This portfolio could be purchased for the price of one low commission of $9.95/trade. This product allows for instant diversification, and keeps costs low on a per position basis. I find this story to be very inspiring, because it showed how an ordinary person who never earned a high income was able to amass a dividend portfolio worth $8 million by the time of his death. This portfolio was a result of frugality, hard work, and ability to buy stocks to hold for decades, while patiently reinvesting dividends. Ronald Read didn't have a finance degree, nor an MBA, but was an ordinary Joe who managed to save and invest for the long term. The story is appealing to me because it shows that investors who pick quality blue chip stocks to hold for decades, and reinvest those dividends patiently, can accumulate a sizeable portfolio over time. The important trait is patience. 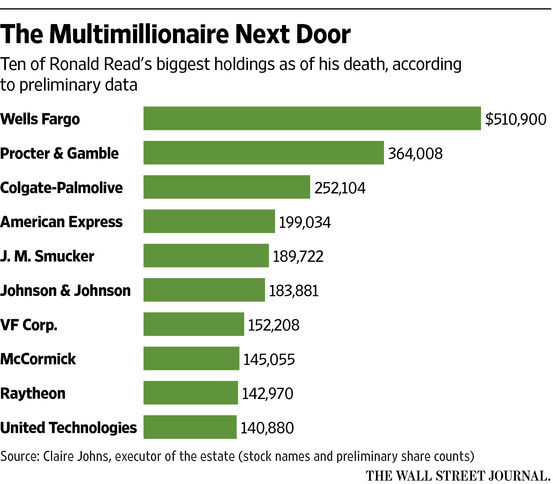 I follow the same slow and steady approach to long term dividend investing as Ronald Read. Thank you all for reading Dividend Growth Investor website. What were the best dividend investing articles that you read in 2015? How did I do in January?